It was a bad weekend for fires in historic districts. London's Camden Lock Market and Seoul's Namdaemun were destroyed. I'm not certain but I think much of what burned at Camden Lock were the higgeldy-piggeldy makeshift booths and stalls. It would be very surprising if there were any sort of fire suppression system in the open-air part of the market. I've been there many times: there's cooking oil sizzling right beside stacks of painted canvases, bins of Peruvian woolly jumpers next to junky electric lamps, extension cords winding everywhere... it's not exactly fire safe. The good thing is that the canal provides a fire block to the south of the market which probably prevented further damage. 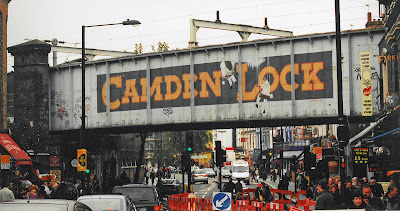 Camden Lock will be rebuilt rapidly, no doubt, although it will be rough going in the meantime for the those people whose livelihoods depend on visitors to the area. As for the destruction of 600 year old Namdaemun, this really is a tragedy. It seems to be a classic heritage site management disaster. According to this news report, visitor access to the gate had been re-opened recently while staffing kept was at a minimum. There were no alarms or sprinklers, there were just eight fire extinguishers to protect "National Treasure number one". Sprinkler systems, fire doors and other fire-prevention tools affect the authenticity and integrity of historic structures: there is a general reluctance to alter cultural properties for safety purposes. Traditional building materials and their decorative finishes tend to be highly flammable. 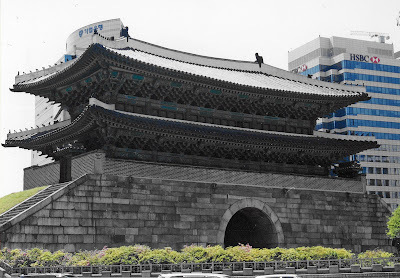 The wooden lattice construction of structures like Namdaemun allow fire to spread quickly and easily. Moreover, sprinkler systems are particularly intrusive in this kind of architecture. I don't know what the ideal solution is. I'm just saying, "what a shame, another important timber monument is lost". Fire codes are a recent thing, even though some historic structures were built with fire control in mind. Things burned: they burned often. Remember that time when half of London burned down? Well, what happened to Namdaemun is certainly a tragedy, but as we know, historical wooden structures in that part of the world are normally regularly rebuilt anyway, so I'm sure it'll just be rebuilt again.